Secomb Close is not on Google Maps. Turn off the Princes Hwy at the Traffic Lights in Lakes Entrance. This is Myer Street. 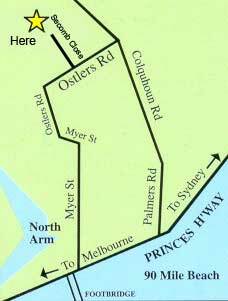 Stay on Myer Street for 3.2 KM, the name changes to Ostlers Road. Then turn left into Secomb Close, we are at the end of the Court.